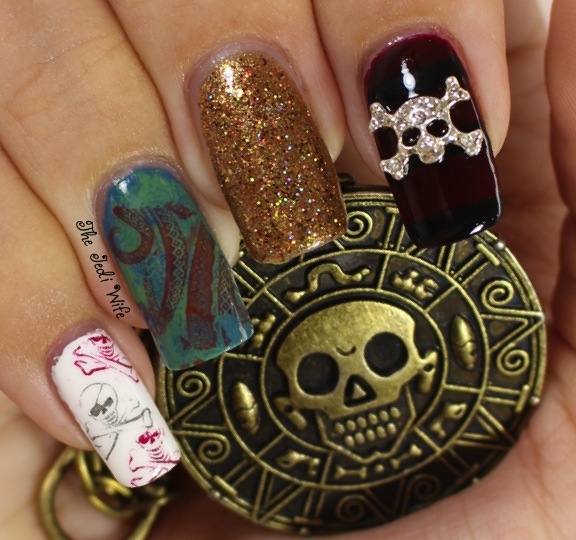 Avast, me hearties, and feast yer eyes on me pirate nail arrrrrrrt! As much as I would love to write an entire post in pirate speak, it would likely be a little difficult to read, not to mention writing on my end. As you may already know, today is International Talk Like a Pirate Day, and it is probably my second favorite day after Halloween. It always is a good excuse to do pirate themed nail art as well, and I managed to do my nails this year for it! Check it out! Ellagee: Drink Up Me Hearties Yo Ho! Trying to get my thumb in for poses is always awkward for me, but it is currently painted in the gold polishes to match my middle finger. They are the limited edition Sweet Heart Polish and Ellagee Pirates of the Caribbean inspired duo that I review previously; the duo along with this awesome pirate coin keychain I'm holding are still available for purchase! My stamping skills need a little more work (hurry home, new stamper! ), but overall, I am loving this manicure! I really enjoy doing themed manicures, and I definitely need to do them more often! 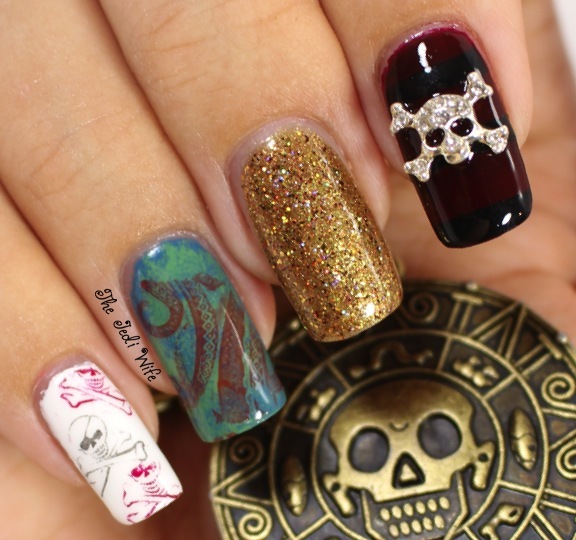 Did you do any special nail art for Talk Like a Pirate Day? I'd love to hear from you! Until next time, me hearties, have yerselves a wond-arrrrr-ful day!